In only 17 years Cometic Gasket, Inc. has grown into a leading worldwide supplier of custom and short-run gaskets for the motorsports industry. What originally began in 1989, in a 1200 square foot office with limited production facilities, has transformed to a 40,000 square foot state-of-the-art manufacturing center, located in the heart of the Midwest. Today, Cometic produces and ships more than 5,000 types of gaskets to customers throughout the United States, Europe, Canada, Australia, New Zealand, and Japan. 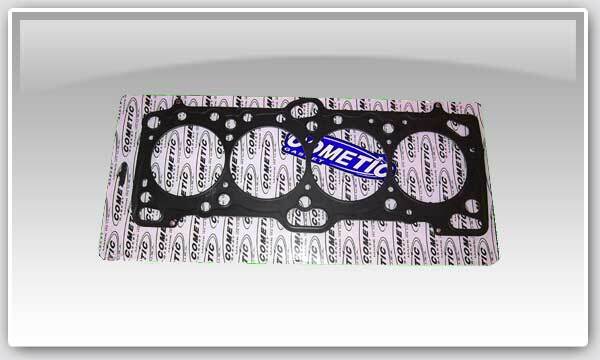 Cometic multi-layer steel (MLS) head gaskets are comprised of three layers of stainless steel. Cometic uses stainless steel for increased strength, its ability to rebound, and improved corrosion resistance. The outer layers of the gasket are embossed and coated on both sides with a flouroelastomer rubber based material (Viton) designed to meet the demands of a variety of harsh sealing environments, load conditions and surface finishes. Cometics Viton coating is heat resistant to 250 degrees Celsius or 482 degrees Fahrenheit. By design the MLS gasket promotes an even torque across the sealing surface allowing for measurable reduced bore distortion. Cometic Gasket, Inc., is a leading worldwide supplier of shelf stock, custom and short-run gaskets for the performance aftermarket, original equipment andmotorsports industries. What originally began in 1989, in an 800 square foot office with limited production facilities and capabilities, has evolved into a 70,000 square foot, state-of-the-art manufacturing center. Today Cometic produces and ships more than 5,000 types of gaskets to customers worldwide. Cometic is dedicated to customer satisfaction and provides quality products, delivered on time at a competitive price, designed for each customer’s specific application. Cometic is an industry leader in manufacturing processes and is committed to the highest possible quality materials paired with knowledgeable personnel.